Canuel is a full service catering company serving the Fraser Valley, Surrey, Coquitlam, Port Coquitlam, Port Moody, Cloverdale, Delta, Richmond, Vancouver and the entire lower mainland. 25 Years of Excellence in Multiple Culinary Environments! Canuel Caterers offers a food and beverage service concession for Coquitlam Sport and Leisure Complex, Poirier Sport and Leisure Complex. 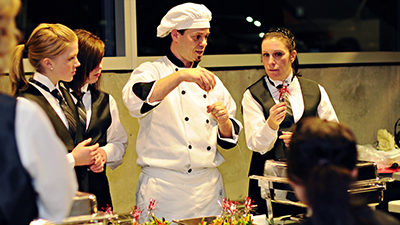 Canuel Caterers currently provides both in house cafeteria services and student meal programs in the Lower Mainland and the Kamloops Thompson River area of British Columbia. Our catering staff are experienced professionals who work with you from start to finish to ensure the highest level of customer satisfaction. Canuel Caterers is a full catering service company located in Surrey, BC, the largest and fastest growing city in the lower mainland of Metro Vancouver, BC. We provide service to the BC Lower Mainland, Langley, Tri-Cities, North Shore, White Rock, Richmond, the Fraser Valley, Kamloops and most places in between! Canuel Caterers is your catering, wedding, corporate event catering and banquet facilities specialist including being a provider for Lower Mainland banquet halls. Canuel Caterers also provides service to 45 High School Sites in the municipalities of Vancouver, North Vancouver, Surrey, Delta, Richmond, Coquitlam, Port Moody, Port Coquitlam, Maple Ridge, Chilliwack, Langley and Kamloops.